Welcome to Kasper Organics! I'm so glad you found little ol' me amongst all the giants. And thank you for supporting a woman-owned, small business. This is the best place to buy hemp and organic cotton products. We offer high-quality organic cotton clothing and household basics. These are mostly made in America. We also offer fair-trade jewelry and gifts such as Triloka, some of the best available in quality, as well as social and environmental responsibility. Most recently I have added some vintage jewelry and upcycled pieces. We also offer fair-trade clothing from Maggie's, who has a long-standing, solid reputation for social responsibility and good environmental practices. Maggie's made in USA organic socks have been a staple for many years. Our organic bed sheets and blankets have been very popular. 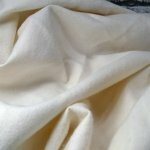 They are super soft and pure, organic high-quality cotton, and also made in USA. Another favorite are our organic Turkish towels. Plush and pure organic towels make a wonderful healthy home wedding gift or an exceptional house-warming gift! Our beautiful Organic Cotton Flannel Sheets are now on sale!